We build the Red Snowman Christmas Wreath With Lights in our workshop. 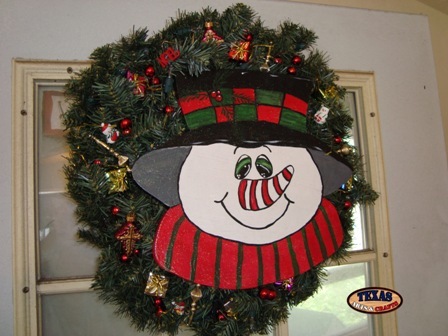 The Christmas Wreath Snowman is hand painted white with a red and green striped scarf. The Snowman has a black hat that has a red and green checkered band. There also is mistletoe on the hat. The wreath is decorated with ornaments and multi colored lights. The dimensions are 19 inches tall by 19 inches wide by 4 inches deep. The Christmas wreath weighs approximately 8 pounds with packaging. For the continental U.S. shipping and handling is included in the listed price. For shipping outside the continental U.S. please contact us through our Contact Us page. We build the Blue Snowman Christmas Wreath With Lights in our workshop. 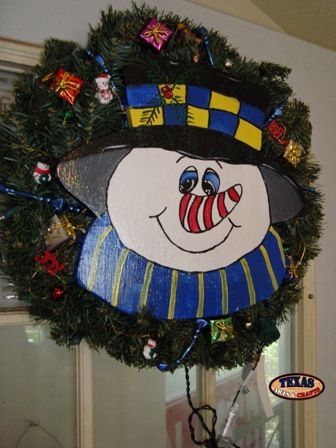 The Christmas Wreath Snowman is hand painted white with a blue and yellow striped scarf. The Snowman has a black hat that has a blue and yellow checkered band. There also is mistletoe on the hat. The wreath is decorated with ornaments and multi colored lights. We build the Cowboy Santa Christmas Wreath With Lights in our workshop. 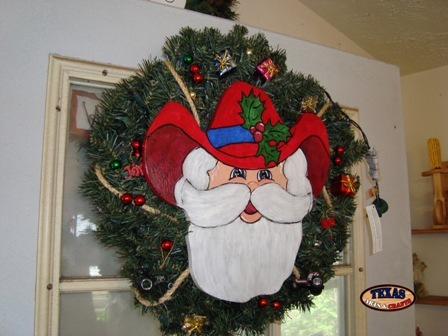 The Christmas Wreath Cowboy Santa is hand painted with white beard. The Santa has a red hat that has a blue band. There also is mistletoe on the hat. The wreath is decorated with ornaments and multi colored lights.